Our tailoring training classes, based at Tunguli Health Centre, are going from strength to strength. They are much in demand! In the expert hands of Ester, a skilled local tailor who leads the groups with enthusiasm and commitment, many local women are learning skills that will provide an income for their families in the future. Each course runs for 3 months and students are asked to contribute £5 a month towards the materials they need. We plan that all courses will become self-sustaining eventually, as women become competent and confident enough to sell what they make. It is encouraging to see that some students have already reached that point. We have recently converted some of our hand sewing machines by adding bases, superbly made and fitted by Frank, a local ‘fundi’ - see December 2018 update below. This means that students can become competent in basic techniques on hand machines before progressing to the speedy output of a treadle machine. We know that Ester is delighted with this upgrade and would like more treadle machines. Her students would like help to buy machines of their own for home use when they finish the course, and we will be looking at a scheme that allows them to do that in due course. This skills training project is highly valued by both the community and Mission Morogoro’s Trustees, as it offers a way out of poverty for women who depend on subsistence farming. On our visits to Tunguli we see for ourselves the impact of climate change on the natural environment, with both drought and flood wreaking havoc on the village and surrounding hamlets. This training will mitigate some of the impact of the daily challenges people face by supplementing household incomes. Ester has just sent us exciting news of her students, Neema and Mariamu. ‘Here is Neema George Mngoya a sewing course graduate busy with economic activities. ‘Here is Mariamu Kilimo a sewing class graduate as well. We are thrilled to receive these stories of success from Ester, showing what a real difference can be made to the lives of many women through tailoring training. We hope to be able build on this success in the future and provide support and training in business skills – watch this space. In the meantime, this photograph of recent graduates from the course shows their obvious pride in their achievements. We at Mission Morogoro share their happiness! This has been an exciting year for the sewing project as our excellent trainer Esther Mwedipendo continues to develop the sewing skills of local women. The MM group who visited the village in August this year attended a very moving graduation ceremony at which there was a great sense of achievement and excitement. The students attend the sewing classes in a Health Centre meeting room using mainly hand machines until now. The courses are full-time for 3 months although Esther would like to extend these to 6 months. The results are excellent as can be seen from the stunning outfits the graduates are wearing at the ceremony. In addition they make clothes for their families and some of them also sell at local markets. You can imagine their excitement when MM agreed to order two sample treadle bases to convert hand machines. This week they were delivered, assembled and demonstrated by Esther. This video has just arrived from Isaac (HC Director) and Esther tells us that they are fantastic and she would love some more. It is our long-term aim that this growing sewing project will become self-sustaining and will enable women to supplement their income and provide for their families. You have given us a lot of support and encouragement for which we thank you. October 2016 marked the beginning of an exciting opportunity for the women of Tunguli. The hand sewing machines shipped out over recent months began to come into operation, when 12 recruits joined a long-awaited sewing training course at the Health Centre. Under the expert guidance of Agnes and Evelynn, both trained tailors, the 12 women joined a 3 month sewing training course. For the first time they were able to produce clothes for themselves and their families. On our visit in November 2016 It was exciting to be able to see first-hand the achievements of the newly formed sewing group. Each student had clothes that they proudly showed us – dresses for children as well as skirts, dresses and blouses for themselves. It was very encouraging to see the high level of achievement in just 3 months. We also saw the two solid tables and 12 chairs that had been generously donated by Arcaid, meaning that the students did not need to operate machines sitting on the floor – quite a challenge! We also delivered a generous supply of cotton reels and equipment kindly donated by many of our supporters. The sewing project is significant in its link with another key project that supports women’s groups in the community, giving them a voice and opportunity. There are 11 ‘Tushikamane’ women’s groups being developed in Tunguli and its surrounding hamlets, delivering a maternal health programme. Several key projects have been identified that show the potential to provide an income in the longer term. Over the next few months we will follow their progress with interest. 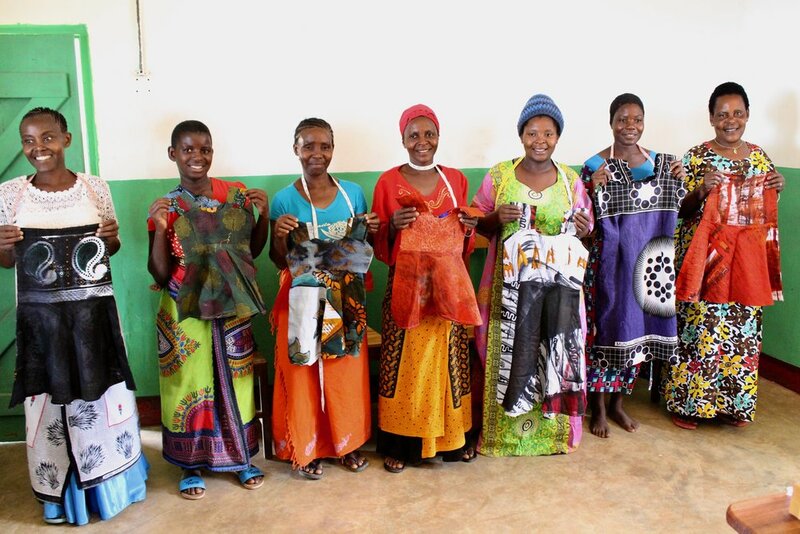 By November a further 28 women from Tunguli village and around had asked to join the sewing project, and Dr Alex Gongwe, the doctor in charge at the Health Centre, is already planning for the next phase. As well as arranging the next training course for new students, this phase will enable the current students to continue their sewing training with a level of independence. While on our visit, at a meeting with a local government Ward Officer, the idea of developing a centre for producing school uniforms was proposed. This is a challenging but exciting prospect and one that we all see as providing great opportunities for the future. There are around 1,650 children currently attending local primary schools alone in the Tunguli ward. Tunguli and its hamlets are already seeing the benefits of the sewing project. We will continue to nurture this initiative as it grows and value the part our supporters have played in this exciting venture. As a charity Mission Morogoro works to empower the women of Tunguli village. We are very excited that this sewing project will give the villagers the opportunity to provide for their families. Hand sewing machines and supplies have already been shipped to Tanzania, providing everything needed to run the project. Our thanks go to the charities TWAM (Tools With A Mission) and Workaid for supplying and shipping the hand sewing machines. A 3 week taster course (see pictures below) was held last autumn for 20 students. It proved a great success and more training was requested. This new course will run daily for 3 months from October 2016 in a room provided by the Health Centre. The course will be led by two local, experienced women tailors, Agnes and Evelyn. 12 local people have already enrolled and indications are that demand will far exceed this. Attendees will pay £2 per month to show their commitment and the total cost of running the course will be £550. We are now fundraising to finance this and ask for your support. Mission Morogoro is very grateful for all donations.